"If information regarding targets exists, it should be made publicly available to the security community so we can better protect ourselves," Skylight said in a post. 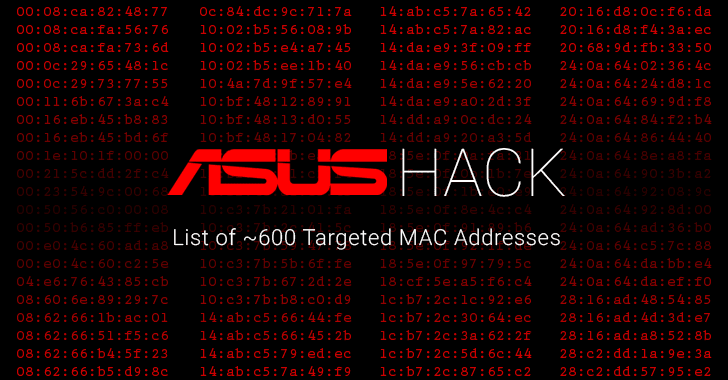 They used a powerful Amazon server and a modified version of HashCat password cracking tool to brute force nearly 583 MAC addresses in less than an hour. As we reported last week, Kaspersky discovered the attack, which it dubbed Operation ShadowHammer, after its 57,000 users were infected with the backdoored version of ASUS LIVE Update software. So, to help its customers know if they were a victim of the attack, ASUS also released a diagnostic tool using which you can check whether your ASUS system was affected by the malicious update. The identity of hackers and their intentions are still unknown. The Hacker News will update you with any new developments.